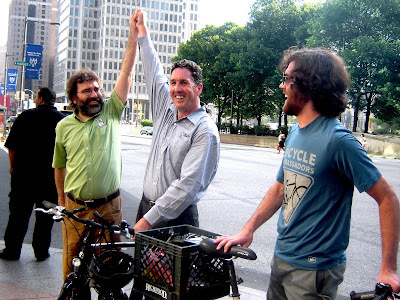 Greater Philadelphia Bicycle News: Commuter Race Results Are In...And The Bicyclist Wins! Commuter Race Results Are In...And The Bicyclist Wins! 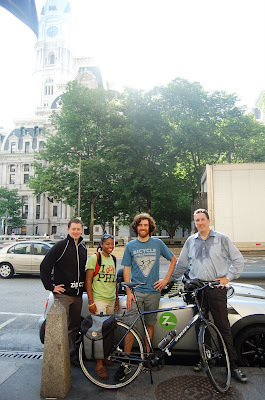 In addition to being an affordable, healthy, sustainable, and fun method of commuting to work, Philadelphia learned today that bicycling is one of the fastest ways to get around our city! Proving again the theory that a bicyclist who commutes four miles or less in Philadelphia will generally arrive before --or within a few minutes of-- other commuters during rush hour, in the Bicycle Coalition's 6th Annual Commuter Race this morning the bicyclist was the first to arrive. The motorist followed 5 minutes later, and the transit user 10 minutes after that. The race began at the corner of Frankford Ave and Master Street in the Kensington neighborhood at 8:00 a.m., and competitors raced to the center of Center City, 15th and Market. Pat Cunane, CEO of Advanced Sports, Inc., was the bicylist, riding his Breezer commuter bike in office clothes. Our Bike Month Coordinator, Nisha Mitchell, was the transit rider; and Jeremy Nelson, general manager of ZipCar Philly, drove a Mini Cooper convertible provided by ZipCar. Bicycle Ambassadors accompanied the bicyclist and motorist to make sure that they followed all rules of the road. Thank you to all of our contestants and sponsors! Check out additional photos here. Lieren: You have won a Planet Bike Cascadia Fender courtesy of EMS and a Bicycle Jersey courtesy of Bucks County Bicycles. Sally: REI Seatbag with patch kit and tire levers courtesy of REI. Icelello: Winner of Fruit and Veggie take home case courtesy of The Fruit Guys. Team Septa: Winners of Aluminum Water Bottles courtesy of Zipcar and I Bike PHL T-shirts courtesy of the Bicycle Coalition. ALL RIDERS in the Commuter Challenge are entered into in the Individual Competition and are eligible for raffle prizes. It's not to late to sign-up, start riding, and win the some great end-of-the-month prizes, including a Breezer Ziggy Folding-Bike! Great post! I love riding my bike to work... fast, cheap and breezy. Also wanted to say thanks for the pretzels and info at the rest stop on Friday! I caught this on tv last night. I'm glad the bike won. I like Pat from ASI (I've met him several times and you guys too at BCGP) but he's sweating like a dog after the race. That obvious detail totally kills the argument that bikes are an effective transportation tool to get to work. I can just imagine what lay people are thinking when they see Pat all sweaty like that. Plus, at just about 3 miles from the corner of Frankford and Master to City Hall, Pat must have been hauling to make it there in 13:20. This is why I say its important to have two riders. A fast rider (that still follows all traffic laws, BTW) and a slow, casual rider going at a relaxed 10 to 12mph. Google bike directions, that uses a 10mph riding speed in its calculations, still predicts the ride time at only 19 minutes. Also, next time make the driver (and cyclists) find and pay for parking. That should add a good 10 to 15 minutes for the driver and is much more realistic. Same thing in Vancouver, BC. Bikes were the fastest, then cars and in dead last was transit.